SAN FRANCISCO Dell's financial decay worsened during its latest quarter as the company slashed its personal computer prices in response to the growing popularity of smartphones and tablets. The dismal performance announced Thursday provided the latest evidence of a technological shift that is making it difficult to sell laptop and desktop machines. Until recently, consumers had regularly replaced machines with faster ones every few years. The money is going instead to powerful, more convenient mobile devices such as phones and tablets. PC makers have had to cut prices sharply, obliterating their profit margins. The trend also has hobbled another technology powerhouse, Hewlett-Packard Co. (HPQ), which is scheduled to report its latest quarterly numbers Wednesday. If there's ever an opportune time for a company to flounder, this is the time for Dell Inc. (DELL). That's because Dell's board of directors is trying to persuade shareholders to accept a $24.4 billion buyout offer from CEO Michael Dell and other investors. Some shareholders say the offer price of $13.65 per share is too low, but Dell's board contends it's a good deal in light of challenges facing the company. The results for the fiscal first quarter, which ended May 3, should reinforce the board's point. At the same time, opponents of that proposal may question whether the Round Rock, Texas, company is deliberately finding ways to make the results look as bleak as possible in an effort to get the deal done. Michael Dell didn't participate in Thursday's call. Before the buyout offer was announced in February, he regularly appeared on the call. A shareholder vote on the buyout is supposed to be held by Aug. 2. Two of Dell's largest shareholders, billionaire Carl Icahn and Southeastern Asset Management, are trying to block the sale to Michael Dell with an alternative proposal that would keep the company publicly traded. If Michael Dell's offer is accepted, it would end Dell's 25-year history as a publicly held company. Both Michael Dell and the dissident shareholders believe the company can bounce back by expanding beyond PCs into more promising technology segments such as business software, services and, of course, tablets. The turnaround promises to be bumpy, and the two sides disagree on whether that is better done as a public company or as a private company that doesn't have to report quarterly numbers and can focus on long-term results. Icahn also doesn't believe Michael Dell, who founded the company 29 years ago, is the right leader. Michael Dell, the company's largest shareholders, would remain CEO under his buyout proposal. Investors had originally been betting a higher offer would emerge for Dell after Michael Dell and his partners reached their agreement with the company's board in early February. That's not the case any longer, as illustrated by Dell's stock's falling below the buyout offer. Shares fell 3 cents to $13.40 in Thursday's extended trading, after the results were released. That's 25 cents below Michael Dell's offer price. Dell Inc. earned $130 million, or 7 cents per share, in the latest quarter, compared with $635 million, or 36 cents per share, a year earlier. If not for certain items unrelated to its ongoing business, Dell said it would have earned 21 cents per share. That figure was below the 35 cents per share expected on average by analysts polled by FactSet. The shortfall doesn't come as a shock. Speculation that Dell missed analysts' earnings target mounted earlier this week after the company disclosed that it would release its results ahead of schedule. The report originally was intended for release next Tuesday. Dell's revenue for the period dipped 2 percent, to $14.1 billion, about $600 million above analyst predictions. The company benefited from an improvement in its non-PC operations, where revenue climbed 12 percent from last year. Some of that came from the September purchase of Quest Software. But nearly two-thirds of Dell's revenue still comes from PC sales. Even with drastic price cutting, PC demand weakened, particularly for laptop machines. Laptops aren't as inviting now that there are so many sleek smartphones and tablets on the market. The mobility portion of Dell's PC operations, the part consisting primarily of laptops, suffered a 16 percent decline in revenue to $3.6 billion in the latest quarter. 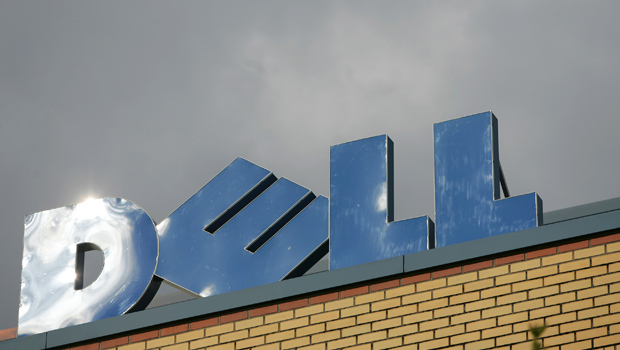 Overall revenue in Dell's PC division dropped 9 percent, to $8.9 billion, from last year.